One of the constitutional obligations of the Board of Deputies is to take such appropriate action as lies within its power to advance Israel’s security, welfare and standing. As you may know, last year Yachad UK narrowly achieved a two thirds majority at the Board of Deputies to be admitted as a member. At the time, I along with the 60 other Deputies that voted against their admission were concerned that this would lend credibility to an organisation that is outside the mainstream of Jewish life in the UK and has a well-known reputation for demonising and delegitimising the Jewish State of Israel. Indeed I was aware that Yachad funds numerous “educational” trips to Judea and Samaria, known to them as “the West Bank”. Their guides include a member of the infamous fringe group “Breaking the Silence”. On such radical groups, the reputation of Yachad hangs. Even the left-wing Haaretz newspaper described Breaking the Silence as having “a clear political agenda, and can no longer be classed as a ‘human rights organization.’’’ In fact as I am sure you will agree, checkpoints are an essential security requirement for the citizens of Israel. As far as I am aware, there are no such Yachad-funded “educational” visits to Israeli terror victims. Had there been, Yachad might get a different Israeli perspective of the need for security and check posts. Their activities in Israel are entirely pro-Palestinian and anti-Israel. However if this was not bad enough it has now been drawn to my attention that Yachad’s tours have, in the past, stopped at the Tamimi house for drinks and a briefing from the family themselves. Having already read the article about the Tamimi family [source], I was absolutely shocked to learn that Yachad had gone beyond giving legitimacy to an Israeli political group with an agenda that undermines Israel’s security but is also giving legitimacy to the family of a well-known Pallywood “star”. 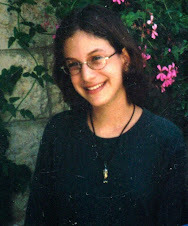 This led me to do further research on the subject and I came across the blog “This Ongoing War" which was cofounded by you and inspired by the tragic murder of your daughter, Malki, at the age of 15 in a massacre in the centre of Jerusalem carried out by Hamas, the infamous Sbarro massacre. In particular I saw this recent article: 07-Sep-15: Peace, human rights, the sheer joy of killing people. 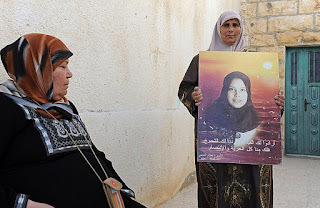 There, you state that Ahlam Tamimi - who rode with the suicide bomber, helped him and his explosive-filled guitar pass without interference through the Qalandia security crossing - can be seen on video exulting over the murder of the victims and is in fact a cousin of Bassem Tamami, the father of Shirley Temper. Clearly this raises the most serious questions about Yachad that I intend to raise at the first possible moment. I would therefore be grateful if you could provide the evidence of the relationship between the Tamimi family of Pallywood fame and Ahlam Tamimi. Ready, willing and able to oblige, Mr Berens. Bassem Tamimi operates a publicity business which has staged and videographed Friday clashes in a village in the Binyamin region a few kilometers north of Jerusalem by the name of Nabi Saleh for years. This is the Tamimi who, under the title "Palestinian human rights activist", is heading to the US now for a month-long roadshow during September and October about which we commented a few days ago ["07-Sep-15: Peace, human rights, the sheer joy of killing people"]. Amnesty International which took him under its wing some years ago is among the groups paving his way in the US. Bassem is married to Nariman Tamimi. Their children include A'hed Tamimi, aka Shirley Temper, a front-and-center role that her kept her in the camera's focus for the past five years ["06-Sep-15: The making of a pigtailed provocateur"]. 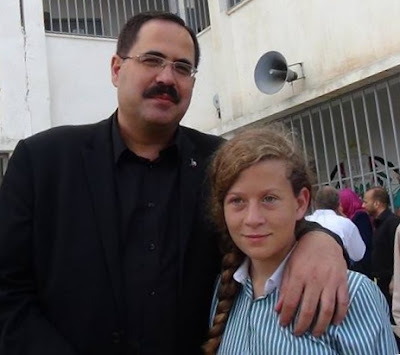 She is now about 15 and adored by Aljazeera [see their recent video promo] and by the PA Minister of Education (he's the moustached one in the photo on the right, taken a week ago). A son, Mohammad, now about 11 is the boy who appears with an arm in a cast and head in a headlock courtesy of an IDF soldier in a viral video that emerged two weeks ago. A female in her mid-thirties, Ahlam Tamimi was convicted of engineering the 2001 Sbarro massacre in which 15 people were murdered - among them our teenage daughter Malki - and sentenced to sixteen terms of life imprisonment. The three judges of the judicial panel, plainly shocked by the cold-bloodedness and complete absence of remorse on the part of the convicted killer in front of them, formally recommended that no consideration ever be given to early release via political deals or amnesties. 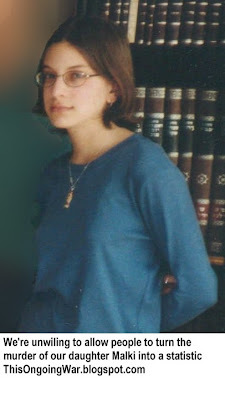 But in 2011, along with 1,026 other convicted terrorists, she walked free in the Shalit Deal. She returned to Jordan where she was born and had lived most of her life. Today, she is living the life of a celebrity there, advocating for more terror and attracting a world-wide audience of Arabic speakers via a weekly television program produced in Amman and beamed via satellite to Arabic-speaking homes on every continent. Her unwarranted release from prison after serving a mere eight years behind bars was greeted with undisguised and joyous celebration in Nabi Saleh. Images – like those on the right – of Tamimis celebrating are easily found on the Web. Dusty, undistinguished Nabi Saleh seems an unlikely candidate for the large degree of media attention and myth-spinning its residents have garnered. A New York Times Magazine cover story brought the village into millions of American homes in 2013. That piece, which a commentator recently called “a fawning tribute”, focused on the enthusiasm of the villagers for a “Third Intifada”. We felt compelled to address the fabricated claims and concealed realities of the town. Mostly because of its connection to the death of our child, we have followed events in Nabi Saleh for years. We are continually astounded by the way Nabi Saleh’s children – clearly below the age at which they should or even can make decisions about their own well-being – take the lead roles in the “non-violent” confrontations with the IDF staged by the Tamimis each Friday. We are only slightly less astounded by the way the flagrant child-abuse on display there is almost never commented upon by the tellers of the Nabi Saleh tales. The article we wrote - "17-Mar-13: A little village in the hills, and the monsters it spawns" – in response to that massive New York Times exposure is the most widely-read post this blog has had. Most of Nabi Saleh’s 500 residents, as a New York Times piece wrote in February 2012, “belong to the same extended family”. A different NYT story published a year later put it more assertively: "All of Nabi Saleh’s 550 residents are related by blood or marriage, and nearly all share the surname Tamimi." A year after she walked out of her prison cell and returned, free, to Jordan, Ahlam Tamimi married. As happens frequently in Palestinian Arab society, the man she married is her first cousin; their fathers are brothers. 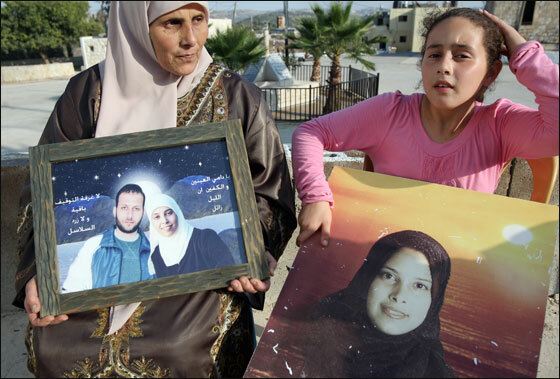 And as happens frequently in the life of the Tamimi clan, the husband is also a convicted and unrepentant murderer. He too was released from life imprisonment in the Shalit Deal. Back to Bassem, whose wife Nariman told Electronic Intifada in July 2011 that Bassem’s sister was "accosted... and hit… on the head" by an Israeli soldier, a female, inside an Israel court in 1993. The sister, not named in that report, died. That sister had a son called Nizar, as a result of which she is referred to as Im Nizar, Arabic for “mother of Nizar” in the article. Now that’s obviously not an actual name but an honorific. Think of it this way: Nizar killed a Zionist and thereby became a celebrity. Thus his mother’s status rises and she gets to be called “Nizar’s Mother”. To summarize: on the basis of the description given by Bassem’s wife, Nizar is Bassem's nephew and Bassem is Nizar's uncle. Nizar is also a murderer. He conspired with two other Tamimi clansmen, Ahmad Yusuf Mahmud al-Tamimi and Sa’id Rushdi Mohammad At-Tamimi, to lure, kidnap, and then kill Chaim Mizrachi [background], an Israeli who bought and sold eggs. The adoration of terrorists who kill Jews and Israelis is at the heart of the Tamimi experience. 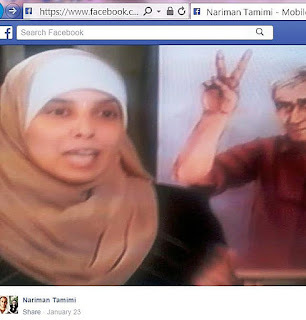 But about five years ago, for reasons most of us can probably deduce, the Tamimis adopted a pose of what they and their backers call non-violence. 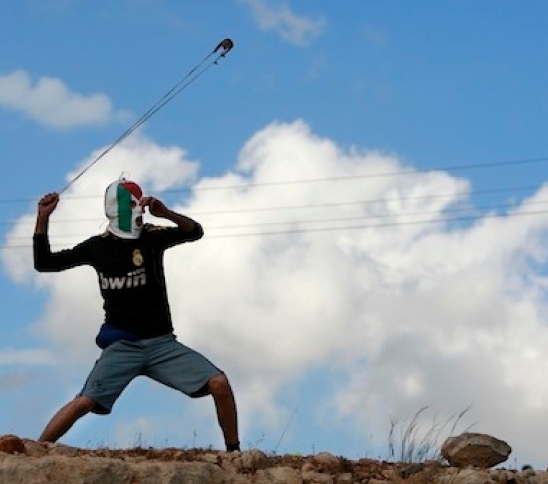 The rocks and petrol bombs continue but because they are classed (by the Tamimis) as tools of resistance, compliant audiences - and there are many - are expected to nod with understanding and allow the non-violence charade to continue. Two weeks ago, we wrote here about Nabi Saleh's Wikipedia entry. Not the English language version which has always been sanitized and projects a carefully cultivated image of Ghandi-like forebearance but the gritty, candid Arabic version. Soon after we first publicized that Arabic version in 2013, someone emptied it of most of its incriminating contents, leaving almost nothing behind. Every reference to the village people's adoration of jihad, martyrdom and death to the Israelis was erased. But then two weeks ago, when we understood what had been done, we went looking and found the original Arabic text as it had appeared on Wikipedia in May 2013. We saved the original Arabic text to here, and a partial English translation to here. They are archived now thanks to the wonders of the Internet, and safe (we sincerely hope) from the destructive attentions of those who feel compelled to re-invent the past..
That deleted Wikipedia text is the village of Nabi Saleh paying tribute to its own viciously violent true self: to its warriors, to its killers, to its dead fighters - all named - and above all to its favourite daughter, the one who smiles on-camera when she recalls how many innocent Jewish children she blew to pieces in the Sbarro pizzeria, our daughter Malki among them. A few days ago Nariman Tamimi was asked in an interview about her family Ahlam Tamimi which took park in the Sbarro restaurant suicide bombing. So her mother is proud of her daughter murdering Jews in cold blood. That's all we really need to know about Nariman Tamimi's world view. So what do you think can be done to get people from the media to own up to what saps they are, continually describing the Tamimis as non-violent when they thirst for the death of Israelis so much that they seem not to care at all for the well-being of their own children? Our fear, borne out of hundreds of encounters with reporters and editors who often seem to know next to nothing about the subjects on which they pontificate, is that when faced with conflicting messages that don't make sense when they come out of one person's mouth, they tend to believe the more politically-correct message if and when the person expressing those views seems really, really serious about it. Sorry to offend the good reporters and editors, but that sort of response seem to happen a lot. Bassem was charged in Chaim Mizrachi's murder and spent 7 months in prison for it. That was where he claimed to have been beaten senseless by SB. He had Nizar and Sa'id take the fall and he ended up back in play, unfortunately.